Not to be confused with Burt the Bashful's Castle. Burt The Bashful's Fort was the first fort that the Yellow Yoshi battled through in and the fourth level of the game Super Mario World 2: Yoshi's Island and Yoshi's Island: Super Mario Advance 3. 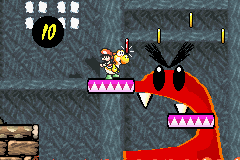 It is also the first level in which Yoshi finds Burts, a notable enemy of the Yoshi franchise, and Boo Guys. It also features the inclusion of Lava Pits to the game. As the level begins, Yoshi finds himself inside the fort. Yoshi can collect some eggs by hitting the Egg Blocks at the start of the level and then aim at the two buckets with a Question Mark on them for coins. In the room some walls may fall on Yoshi. If Yoshi is flattened by a falling wall, he will be unable to move for about seven seconds, giving little time to retrieve Baby Mario. Upon continuing his way, Yoshi finds some Boo Guys operating traps that Yoshi must dodge. Near here are some ceilings with soft bricks. If the player throws eggs at it, the brick cracks. Yoshi can then jump above the ceiling, similar to Super Mario Bros.'s World 2. After that, Yoshi must continue his way until he finds two Burts. Yoshi then has to jump back to the platform and continue forward. After going through the flipper, he must immediately jump left and collect the Flower, as the wall falls on him otherwise. Not far from there, Yoshi finds another pair of Burts. After this are some Lava Pits, which cause Yoshi to lose a life when they make contact with him. After the short lava area, Yoshi will enter a Warp Pipe. Yoshi encounters the Gargantua Blargg in the fort. The pipe leaves Yoshi in a very similar place. Yoshi has to dodge the falling walls and traps and make his way to yet another Lava Pit. Here, Yoshi has to throw an egg at a ? Cloud for a bridge to appear. Yoshi has to try to avoid the Red Blarggs in the lava as he collects coins. He then must jump on a giant platform, which tilt depending on where Yoshi stands. After this are four moving platforms which Yoshi must jump on and avoid the Red Blarggs below. As Yoshi hops on the moving platforms to the right, a Gargantua Blargg rises up from the lava. Yoshi must hit it with an egg for it to go back to the lava, however it will come back after a short time. Yoshi must try to collect the coins floating around until he arrive a platform. Here, Yoshi must push the pot off the platform. When breaking, it reveals a key. Yoshi now has to go back to the door and use the key to enter it. In this room, are three doors and some Burts jumping around. The player must take care of the Burts, hit the Egg Block for an egg supply and enter the second door. Here, the player finds four Piranha Plants, throwing eggs at each of them reveals a Flower. Once Yoshi is back to the main room, he must enter the door to the right, which will lead to the boss room. As Yoshi falls into the room, after entering the door, he notices a small Burt jumping around. Kamek flies into the room and drops magic energy around that will make the Burt grow larger. To attack, Burt the Bashful just hops around the small room falling on Yoshi from time to time. To defeat Burt, Yoshi must throw eggs at him, which makes him jump gradually faster. There is an Egg-Plant in the middle of the arena, if Yoshi would run out of eggs. After six hits Burt the Bashful is defeated, and he loses his "pants" and get red. He then bounces around the screen, losing his enormous size. This page was last edited on April 22, 2019, at 15:13.